WASHINGTON — U.S. Transportation Command is making preparations to push back the retirement of some KC-135 tankers due to delays in receiving the Air Force’s newest aerial refueling plane, the KC-46, the head of the command said Tuesday. “Obviously it’s going to cost money, and when the money is put into the program that’s when we’ll know, but the intent is to retain 28 [KC-135] weapon systems beyond their currently scheduled retirement,” Gen. Stephen Lyons said during a Senate Armed Services Committee hearing. The Air Force won't accept tankers from Boeing until it has a better picture of what is causing foreign object debris issues at the company's production plant. 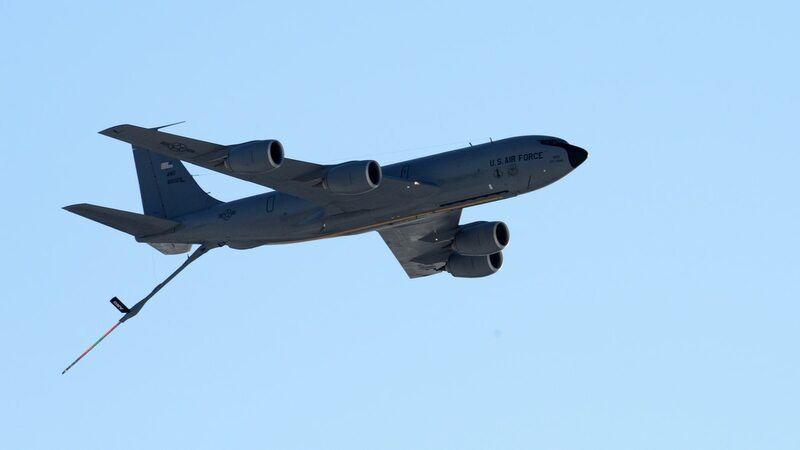 Lyons’ comments came after Sen. Jeanne Shaheen, D-N.H., expressed concern that the 157th Air Refueling Wing located at Pease Air National Guard Base in her home state could have a months-long capability gap between when KC-135s are phased out and when KC-46s begin operating. According to Lyons’ testimony, the Air Force intends to divest the 33-year-old KC-10, its smallest tanker fleet, while retaining a portion of the 57-year-old KC-135 inventory into the 2050s. The KC-135 refueling tanker and the C-130J airlifter will be the next two aircraft to joint the Air Force’s predictive maintenance program. Air Mobility Command has said it needs at least 479 tankers, of which 179 will be KC-46s. “During KC-46 unit conversions, we are working closely with the U.S. Air Force to retain sufficient [aerial refueling] capacity and potentially delay the retirement of KC-135 aircraft in order to maintain sufficient number of aircraft to meet operational requirements,” Lyons’ testimony states. The Air Force began accepting KC-46s in January, about two years late. Boeing’s contract with the service called for it to deliver 18 tankers by August 2017. So far, it has delivered six KC-46s, but the Air Force has halted tanker acceptances after an number of incidents where workers at Boeing’s production plant left tools and other foreign object debris in the aircraft. Even though the Air Force has paused KC-46 deliveries, Lyons maintained that it was a “good idea” for the military to begin accepting the aircraft. While he didn’t elaborate, Air Force leaders have defended the decision to move ahead with KC-46 deliveries so that pilot and boom operator training could begin. Meanwhile Boeing has vowed to redesign the aircraft’s camera system at its own expense, a process that the Air Force believes could take two to three years. Despite ongoing problems with the KC-46, other lawmakers touted their home states as potential future basing options for the troubled tanker. Republican Sen. Dan Sullivan noted that Alaska resides in a strategic location, close to both Europe and the Asia-Pacific region, and already hosts a large military fuel storage facility. Lyons acknowledged that Alaska would provide a strategic location to base KC-46s, but that the Air Force’s plan was not yet complete. “I’m sure Alaska is part of that discussion, but I just don’t know the details,” he said. Correction on 3/5/17 at 5:09 a.m. EST: The number of KC-46s delivered to the Air Force was corrected.